The ruling regime in Eritrea manipulates news and information to gain total control over its citizens. Still life. Image credit Yonatan Tewelde. Recycling old images and tired ideas is also at the heart of what Eritrean state media does. Unless covering President Isaias Afwerki (since 1993), the state media continuously re-use the footage and stories of the 30-year old independence war. Flimsy development projects are disproportionately hyped. Newsworthy events are routinely ignored unless they get out control, and then the Minister of Information only responds in a tweet. The Eritrean government attempts to control its narrative in two ways: outright denial and widespread policing, which promotes fear and extends to the diaspora. Whether in the news media or asylum offices of the West, the Eritrean narrative has been reduced to the bare minimum. Here there is no script. When all civilian members of national service—those who are not in active military, but still in the service—apart from teachers, were recalled to Sawa, the military training center, around January 2006, everyone expected a national crisis. Such moves had never been taken, even when the country was at war with Ethiopia. According to official records, civilian members of the national service numbered around 20,000 then. When judges (including from the nation’s highest court), journalists, medical personnel, bankers, etcetera were recalled to Sawa, the country practically went on hold for a month. All national servants were physically counted and everyone was given a new ID card. After staying in the camp for three to four weeks, doing nothing, suddenly all of them returned to resume their work. The outcome? The president and his cronies demonstrated their power of command. When “Azeb” was permitted to leave the country officially, after being demobilized from the army in 2014, she hoped her three-year old son would soon join her. He was unable to travel with his mother as his father had left the country illegally. As a result, he could not sign clearance papers for him at the immigration office in Asmara. Eritreans cannot legally travel out of the country when they reach the age of five. For children below five, both parents need to sign them clearance to travel out of the country. Finally, sometime around 2015, Azeb arranged to send her son through smugglers to the Sudan and asked her mother to accompany the small boy until they were close to the border town, Tessenei. Security was alerted about the plan as they were preparing, and the three-year old boy was found “guilty” of attempting an illegal border crossing. Hence, he was taken into custody. To accompany the child, his grandmother too was imprisoned, and both stayed in prison for 10 days. Ultimately, Azeb arranged to free her son and her mother by paying a huge bribe and calling upon influential contacts. Finally, the baby was able to leave the country through another convoluted process including bribes. 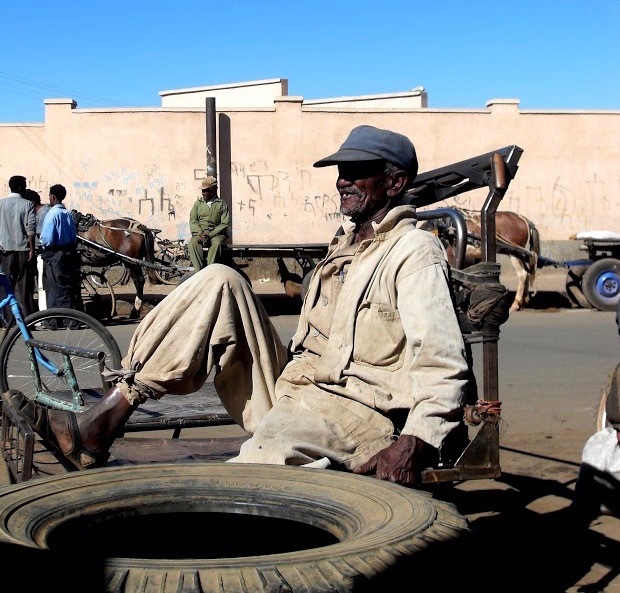 Without any explanation and possibly through the initiatives of some threshold guardians who present themselves as the protectors, the Asmara municipality banned the playing of Amharic (Ethiopian) songs in public places around 2004. City government justified the ban as means to protect national heritage and defend against a cultural invasion (even as state television plays pirated Hollywood films almost daily). 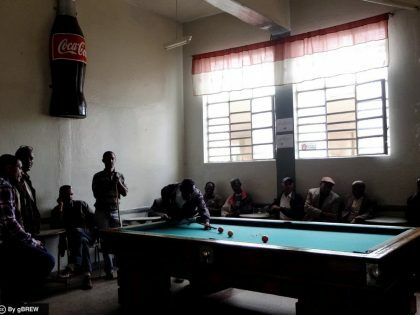 Quickly, other towns and cities followed suit and began fining bars for playing Amharic songs. Many taxi drivers, especially in the evenings, continued to play Amharic music. This was not necessarily because they found the music appealing, but rather as a show of defiance. Similarly, some taverns in Asmara continued to play Amharic songs late at night. Declared as “ሓራ መሬት” (free-land) by many of their patrons, these bars started to attract customers from far afield. “My son just finished his military training in Afa’ebet and returned,” a distant relative told me on the phone when I called him last month. I was not aware of the new military training in Afa’ebet so I asked for more information. “They had the third round now. It is harsh, but doable,” he replied. It is hard to keep up with the mushrooming military training centers where everyone reports that their own is by far worse than the rest. It started with Sawa in 1994, then they opened Wia followed by another one in Mieter. Himbrti was the last center I checked, and now another one has opened. Old centers do not necessarily dissolve when they open new ones. Sawa currently is serving as military training center-at-large for high-school students. Then I checked with another friend about the colleges: They closed Halhale College of Business and Economics in the fall of 2017. In a typical erratic directive issued by the president, they turned the college into a cattle breeding laboratory farm. As it was unplanned, students had to waste one semester before they could be transferred to Adi-Keih. The hosting college in Adi-Keih, in turn, had to close for one semester for building maintenance. After displacing the college, the cattle did not last long. Apart from exclusive privilege extended to ruling party organs and few well-connected individuals, import and export of goods have been outlawed since 2003. Impatient with the long-standing lack of goods, some Eritreans—mainly women whose husbands were in the army and could travel relatively freely, started their own “businesses.” They collect some hard currency from the black market run by the ruling party and then go through the extremely tough airport security checks, including tight body searches. If they manage to smuggle out the hard-currency or have someone wire it to them in Dubai, they can buy three of the permitted electronic household items—such items as washing machines, refrigerators, stoves, TVs, and desktop computers worth up to $1,500. They then ship these few items to Eritrea’s port city Massawa—a journey that takes about a month—and buy smaller items to put in their luggage. In order to collect their goods from the port, they need to present 2 percent income tax papers. In the two pieces of luggage allowed on the plane, they could only carry less than five of any given item, lest it be considered for business purposes and consequently confiscated at the tight airport customs office. A round-trip ticket costs around $500, and the UAE visa runs from $80 to $160 per two weeks and a month’s stay, respectively. Not including other expenses but by a minimum standard, they also pay at least $12-15 per night in the barely equipped guest houses with around 10 beds per a room for at least two days. 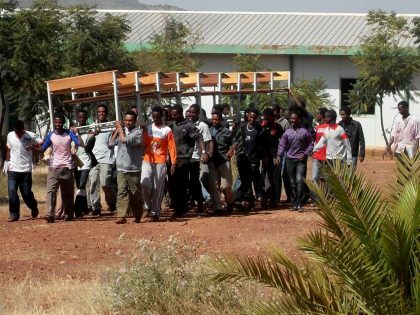 This convoluted routine, which is still happening, has been the regular business many “lucky” Eritreans have been conducting for more than 15 years now. Eritrean cities and towns are as heavily guarded as the country itself. Nationals must show passes at checkpoints whenever they leave and enter any town. The checkpoints’ primary role is to limit the movement of people and commodities. The security and arbitrary arrests intensify at town borders. Unless the person produces a special paper on top of the regular pass, the security officers at the checkpoints automatically arrest the person, especially if young, as s/he would be guilty of illegal border crossing. Despite those restrictions, most cities cannot produce goods and services to export to the next, unless they are contraband commodities. Neither can nationals buy certain items and transport them from city to city. Both public and private transport are subjected to extreme searches at every checkpoint between towns. If someone is found transporting any item of value, either to sell or take it to family members as a gift, these items are confiscated; valuable items often include local produce, such as grain. Since the early 2000s, the Eritrean regime has considered scanners and color printers as enablers of wrongdoing. A few nationals who were running stationery shops at that time had scanned and printed forged passes. Immediately after the forgery was discovered, state security issued a directive that barred stationery shops from scanning any document apart from photographs. Scanners and printers were added to the list of banned imports. He told me that he went back to school by forging a certificate with an adjusted age, as it is the only safe way of staying and helping family. Thanks to his small stature, he could pass for a high-school student at that time. “What grade are you now?” I asked him trying to control my laughter. “Ninth grade, and I still have another two years to finish my high-school,” he laughed back. Schools have turned into the safe havens for those wanting to dodge compulsory military service. Yet, military round-ups in the schools of students who were thought to be older than their documents claim are on the rise. Some schools also fine students who miss classes, since many only show up at school to settle their bills. Many teachers who cannot control their students threaten them with a pass rather than failure. Passing classes actually poses a threat, since graduation means imminent departure from school. 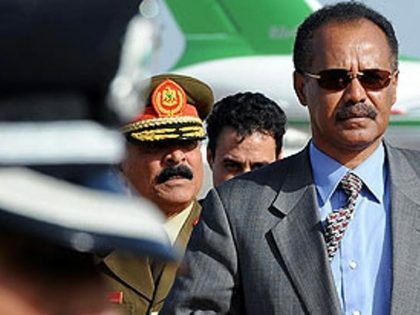 According to the national media’s narrative, President Isaias Afwerki is a visionary; a linguist, an architect, and overall supreme leader. His “golden words,” as they call them, are edited from interviews and recycled as program transitioning. “Healer” has recently been added to his list of monikers. In March 2018, in an interview broadcast on state television, a long-ailing regime supporter testified that she recovered after an encounter with Afwerki at the Adi-Halo dam. Despite four surgeries, the woman had until then been unable to recover from severe knee injuries. She was using a wheelchair until the trip to the dam. As the survivor describes, President Afwerki carried her up from her wheelchair to bathe in what she described “as holy water” of Adi-Halo dam. “To meet the president in person and touch his hand is almost like going to heaven,” she said. The woman testified that following the encounter her doctor declared she no longer needed the wheelchair.